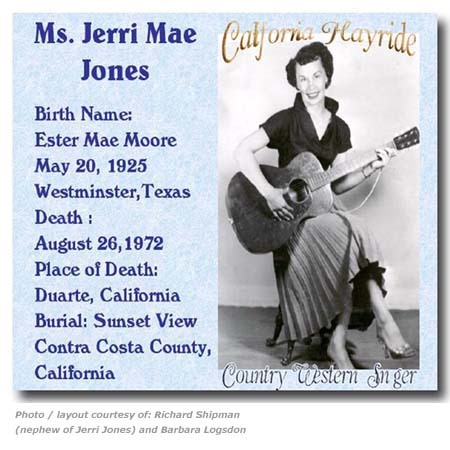 Jerri Jones was born Ester Mae Moore in Westminster, Texas. She started singing when she was just five years old. Her grandfather was a minister who played the fiddle. When he traveled a church circuit in the Oklahoma and Texas, he would have Jerri and her sister along and would have them stand on a chair so they could be seen by the audience. They would appear at churches as well as the radio programs their grandfather did. Jerri was the baby of the family and played bass fiddle. She was said to be a bit of a tom boy growing up and could "...whip almost any boy in the block" back then. Her clothes of choice were jeans and shirt; the only time she would wear a dress was when she was at church. She was also elected president of her high school Dramatic Club. 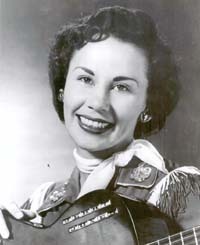 She was a regular on the California Hayride, a show hosted by Cottonseed Clark and Bill Ring that aired over KOVR-TV in San Mateo, California. The show was a 90-minute broadcast on Wednesday nights. It aired "live" from the KOVR studios. 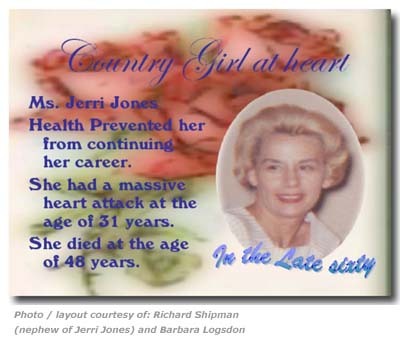 Rena McGowan mentioned in her notes about goings on in West Coast country music in Rustic Rhythm magazine that Cottonseed Clark had "two outstanding girl singers, Jerri Jones and Mary Orlando" on his shows in northern California. Jerri's son Don remembers that she also helped out write a few songs with some of the other artists on the California Hayride but may not have been given songwriter credit on the tunes. She also recorded a duet record in Nashville, however, details are unknown. Jerri worked with Tommy Duncan's band as female vocalist for a time. She also worked with Pete Harrison on his radio shows. She was a part of the KVON radio Frontier Club program. She also worked with Jack Tucker on his Saturday television show that broadcast over channel 11. She did personal appearances throughout the Bay area in Northern California. Jerri was also talented seamstress - she made all of her own costumes. Jerri suffered a heart attack around 1956, when she was just 31 years old which cut her performing career all too short. She passed away in 1972 at the age of 46 years. Copy Courtesy of Don Hoisington, son of Jerri Jones.